Want to take best advantage of Selenium, GRID is the answer. It acts as a load balancer, but for tests. It’s primary job is to distribute the tests to different nodes (machines) registered to the server which has the hub. Let’s get started with the same. Set up of the GRID environment is a two step process. The test is initiated at the Hub and Nodes run the test and send the results back to Hub (server). Advantages of using GRID: Distributed tests mean saving time. Proper usage ensures 80% reduction in execution time. Assuming that the Java environment is set and we have the Selenium server jar file in a folder, below are the steps to perform to start the hub. Navigate to the folder which contains the selenium server in command prompt or terminal depending on the OS you use. 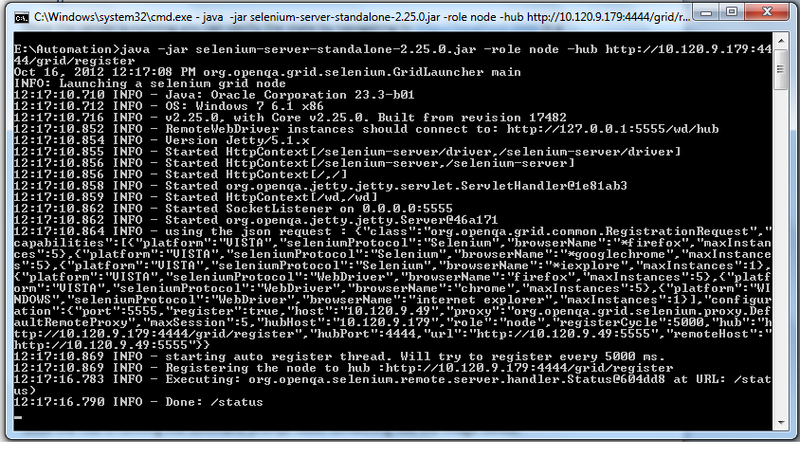 Issue the command “java -jar selenium-server-standalone-2.25.0.jar -role hub“. 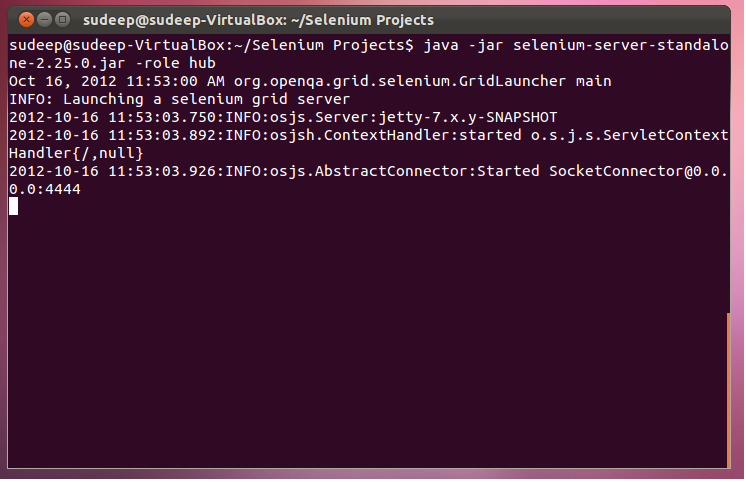 This command starts the selenium server as a GRID hub server. 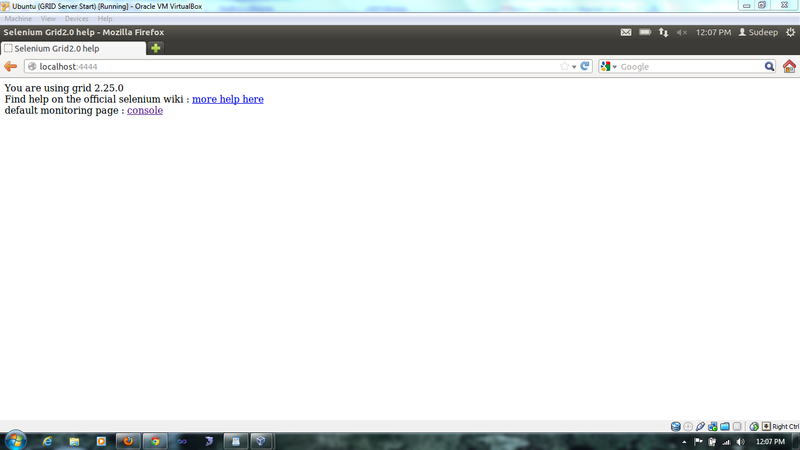 The role defines how the server is to started. Once the server is started, it looks like the following image. 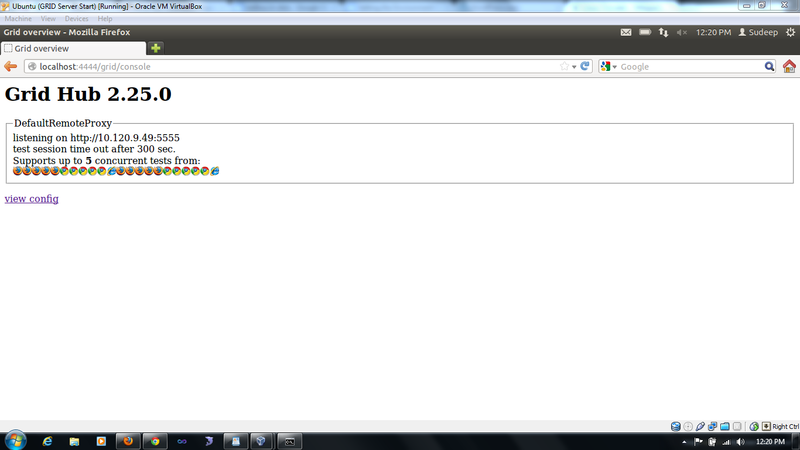 Once the server is running you can verify the state by navigating to http://localhost:4444 in a browser. In that case the screen will like as below. Note: If you have a firewall installed, add an exception for the port 4444 in firewall for http connections. Every node should have java installed. It should also have the same selenium server jar file. Assuming we have the same, the command to register a machine as a node to already running hub is as below. Navigate to the folder where the selenium server jar file is present and issue the following command. Make sure you enter the ip address and do not copy-paste the url given here blindly. If you wish to register the same machine where node is running, instead of ip-address, localhost can be used. Once the hub is running the command prompt looks something like the image below. Now to verify if a node is active, in the Hub machine open the GRID browser view (show in earlier screensho) and click on console link. It will show you the node detail and the browser it supports. The screen looks like as the below image. Tried with the above written codes. I use TestNg Framework instead of Junit.. Do i need to do any modification to run the code in multiple browsers. I guess it’s some configuration issue. Are you sure u have added exception to the ports 4444 and 5555 in the firewall? Also check if you are using RemoteWebDriver() in the code. And also check if the testNG methods for Before, After and Test are imported. VisGrid is a GUI for Selenium Grid. You can start hub, create and attach a Selenium node very easily and quickly.